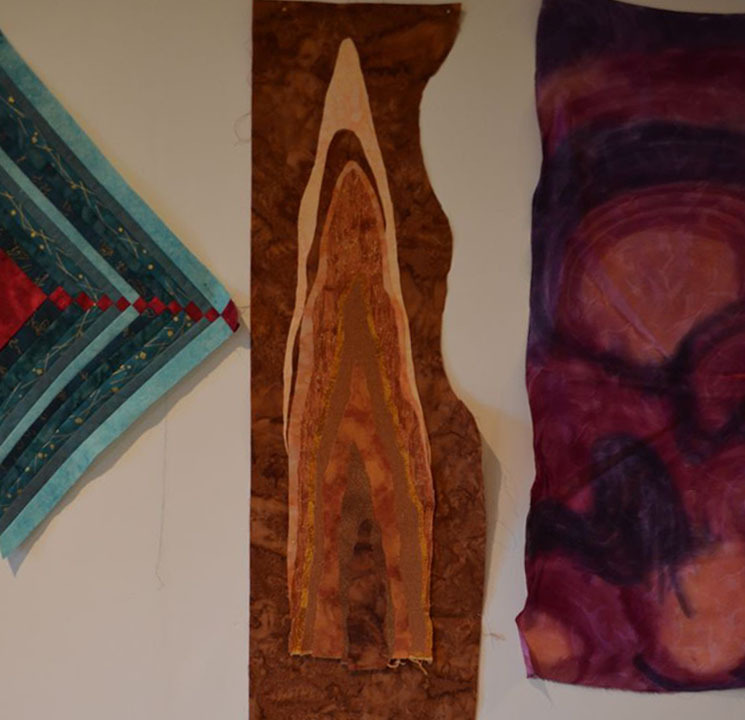 Explorations in Quilting and Life: Pieces of my Mind? Right now, you might say I am between major projects. I am casting around for something to get enthusiastic about. I decided that rather than being idle - not in my disposition by any means - that I would just sew some forms that interested me. I put them all up on my design wall two days ago so I could stare at them. So, Wednesday night our monthly SAQA Visioning call involved a guided meditation by a guest leader, Virginia Kellog. She led us through a guided meditation on vision and goals. Much to my surprise, I began to see some themes from my meditation that related to the patterns on my design wall - much to do with layers. Where this will exactly all lead, I can't really say. I do think that the idea of just letting myself play with fabrics and designs without the pressure of creating a finished piece was productive for me. Perhaps both that play and the guided meditations reflect my subconscious leading me towards my next complete project. Stay posted for the answer!